If you've never heard of OYO then you're missing out. 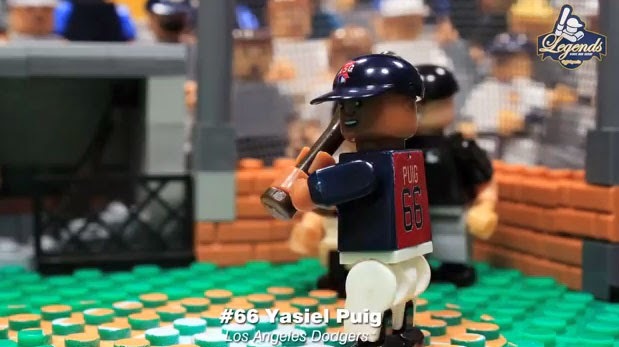 OYO makes Lego-like figurines of athletes and American sports teams for fans and collectors alike. They meld the joy of being a sports fan with the childlike fun of playing with toys.... And, what could be better then that? On their YouTube page they've been producing stop-motion videos featuring their creations, and one of their most recent concoctions features some of Baseball's most memorable home runs. In fact, one the homers it shows is Yasiel Puig very first Major League dinger. Even better, it includes actual audio of Vin Scully's enthusiastic call. Watch it below. Unfortunately, you have to watch one of Reggie Jackson's home runs against the Dodgers in the 1977 World Series. Boo! 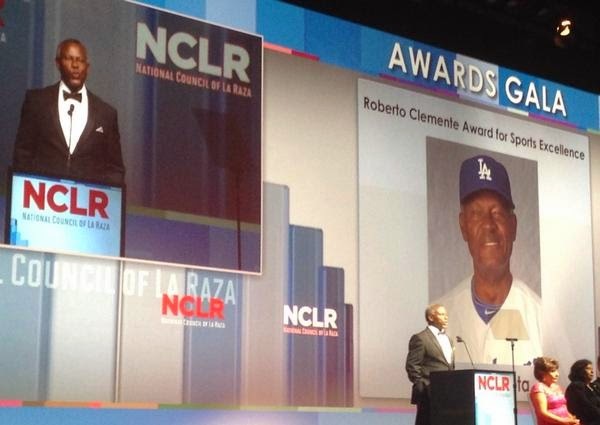 Dodger legend Manny Mota was honored by the National Council of La Raza (NCLR) this past Tuesday at their National Conference Awards Gala in Los Angeles. He was given the Roberto Clemente Award for Sports Excellence which seeks to award a sports professional who has been dedicated to causes affecting Hispanics. Past winners include former Raiders coach Tom Flores and ballplayer Minnie Minoso. With his wife, Margarita, Mota founded the Manny Mota International Foundation more than 30 years ago. The foundation’s mission is to provide educational, health and recreational opportunities for underprivileged and disadvantaged youth. Through the Manny Mota Baseball Clinics, youth are taught to build healthy bodies and minds through positive role models and self-discipline through sports. The foundation also provides communities with the tools necessary for improvement and self-reliance. Since 1992, it has held a yearly fundraising event called the Campo de Sueños (Field of Dreams) Awards Banquet. Proceeds from this event fund a major portion of its humanitarian programs. Mota’s selfless work and that of his family, has received numerous honors. Mota and his family were recognized by the Professional Baseball Scouts Foundation with the Ray Boone Award as “Baseball’s Family of the Year,” and they were honored at Los Angeles City Hall in 2004 by Los Angeles City Councilman Ed Reyes and Council President Alex Padilla. For his extensive career, Mota, a proud Dominican, was inducted into the Hispanic Heritage Baseball Museum during pregame ceremonies at Dodger Stadium in 2003. He also received the Deportista Meritorio, a lifetime achievement award honoring his baseball career and citizenship. This is no doubt a well-deserved award for a great Dodger. Check out the Manny Mota International Foundation website here. You can also follow him on twitter here: @MannyMota11. Below is a video from the event. To watch Mota's speech go the the 1hr:44min:50sec mark (01:44:50). I apologize for not having the video start there, but I couldn't figure that out. 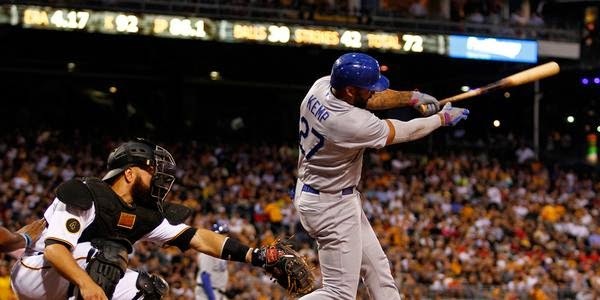 Matt Kemp looked pretty good last night. He walked twice and drove in a run. Unfortunately, he was still stymied since he didn't get a hit. Still, his confidence at the plate is apparent, so I remain hopeful he'll return to form. 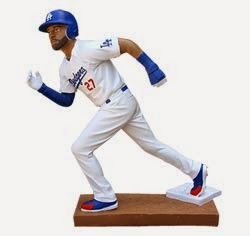 Here's an early peek at the Matt Kemp figurine the Dodgers giving away to fans on Sunday, August 24 on the right. Via Dustin Nosler at Dodgers Digest, "Dodgers’ answer to finding a bat at the deadline: Alex Guerrero." I couldn't agree more. Via Mark Saxon at ESPNLosAngeles.com, "McGwire on Canseco: 'It's too late.'" "Mark, to me, when I played with him, I looked up to him," Canseco told reporters. "I idolized him for a lot of reasons -- the guy was on the field, he was off the field. It haunts me till this day that I said those things about him, even though obviously they were true. I could have gone about it a different way and gotten my point across." Be sure to check out this ESPN video 30 for 30 Shorts on the high-five, here. It's the gesture most associated with celebration in sports, but few know the story of the high five---from its origins to the professional and personal decline of the man credited with its creation, Glenn Burke. Orel at Sons of Steve Garvey writes, "Vin Scully, on BYO Musical Instrument Night at Ebbets Field." Awesome! Shawn Anderson of the Hall of Very Good shares his interview with their Glenn Burke Memorial Courage Award winner Tanner Vavra. He is a ballplayer in the Midwest League who has one eye. It was National Hot Dog day yesterday, so in celebration SI Extra Mustard shares the best hot dogs available from each MLB stadium. Go here to check that out. The 28-year-old stats guru -- dubbed the "Billy Beane of hockey," after the A's general manager -- is jumping to the big leagues after serving in the Ontario Hockey League. In just three seasons, Kubas turned around the Sault Ste. Marie Greyhounds from worst to first in the Western division, building a team around advanced statistics. Of course, if you've really been paying attention then you already know that advanced statistics is already a large part of the game. Just look at the LA Kings. This is the best umpire strike three caller ever! Really.. Watch it below. James Kratch at NJ.com has the story. "The umpire is 'Eddie the Ump.' He calls games like that all the time and is generally a fun guy to be around. He is one of the reasons the league is a great way to spend Sunday afternoons trying to stay young. He also umpires high school and youth games, but would not bring the act on the road to those games as it may cross a line in those circumstances. But with us, it's enjoyable and brings something new to the game."